Need a break after a long drive on Route 66? 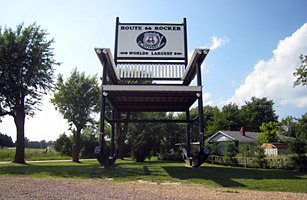 Sit back in this 46-foot-tall rocking chair, located four miles west of Cuba, Missouri. It was built by the owner of a nearby general store who was looking to draw attention to his business. The rockers at the base of the chair are more than 31 feet long and weigh about 2000 pounds each  certainly sturdy enough for a few tourists to relax on. Though if you can't climb quite that high, there are handy benches nearby.